We enjoy watching various games and tournaments live on Television and the commentators make the game more interesting for the people who are watching game on Television. Ian Darke is a famous on the television live game commentary who has been working as an English association football and boxing commentator for long period of time. Darke currently works as commentator on ESPN and BT Sport. His commentary adds more beauty on the live broadcast of boxing and football. 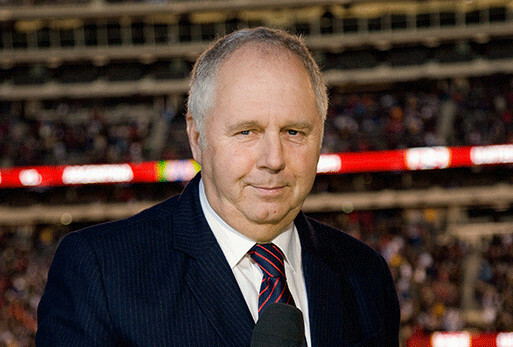 Born on 1954 in Portsmouth, United Kingdom, Ian Darke is considered as one of the impressive commentator on British media. Having long history in the field, Darke has experience of working with many British networks. Darke wored on Sky and he was one among the “Big Four” football commentators in Sky. During his days in Sky he worked with other three football commentator Martin Tyler, Alan Parry and Rob Hawthorne. He has also worked as a main commentator boxing fight on Sky and has covered biggest British Boxing fight along with co-worker Jim Watt. Talking about his early career, he worked in BBC radio for a decade where he covered boxing, football and Athletics. In 1992 after working for ten years for BBC, he moved to Sky Sports in search of more opportunity and started to commentate on the FA premier League which was newly formed. He worked with commentator Martin Tayler and held position of head commentator for Friday Monday Night Football. In 1995, Ian Darke’s role as commentator for Friday Monday Night Football was taken by Rob Hawthorne then he switched permanently to be the main commentator for boxing on Sky. Drake has also commented on various international football matches which had more than 10million viewers. He gave his commentary on the 2005 Champions League semi-final where Chelsea played against Liverpool. During his tenure in Sky Sports, Darke he appeared as commentator for UEFA Champions League many other football matches. He has also given his commentary on many boxing matches that have millions of viewers. In 2010, after Sky did not get right to broadcast FIFA World Cup, ESPN hired Ian Darke to cover the World Cup for American viewers. He was noticed by viewers for his commentary on the last goal of United States against Algeria which led team USA to next level of tournament. He started to give his commentary on the 2010-2011 Premier League Season with Sky but later he was offered contract by ESPN, USA and he accepted the three year contract and moved to the U.S.
Ian Darke is considered as one of the successful commentator who can give life to the live matches and can grab viewer’s attention to his voice. Talking about his personal life, Darke has not spoken anything about his personal life. There has been no any information about his marital status, relationships and affairs. To get more information about Drake he can be followed in Twitter, where he has more than 120k followers.